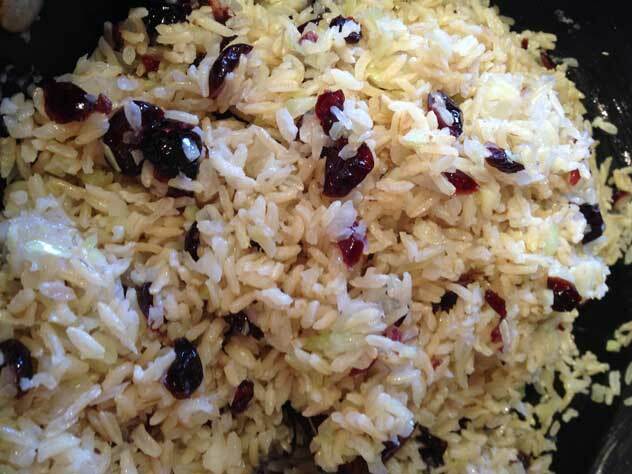 This recipe is only limited by your imagination.Use any kind of rice or grain you like,add sauteed onions and celery, and then brighten it up with dried fruit.Toasted nuts are also a great addition. Heat oil in skillet over medium flame. Add onions and celery and saute until soft. Add dried fruit. Stir until fruit softens. Season to taste with salt and pepper. Add rice to skillet and stir thoroughly until rice is coated with oil and vegetables. Taste and add more salt and pepper if necessary. Add nuts if desired. Remove from heat. Let rice cool to room temperature before using as a stuffing in poultry. Peppers can be stuffed with hot rice. Serve hot as a side dish.